This month's issue begins with the second part of an interview I did with Colin Jones, the former manager of a highly successful blackjack team. Vinny Decarlo describes a cheating scam at baccarat involving several voluptuous ladies. We have several blackjack and trip reports, covering casinos in these regions: Reno (KC Brooks), I-35 corridor between Kansas and Minnesota (JPB), Las Vegas (Stu D. Hoss), Tunica (Mark Gruetze), and Atlantic City (Frank Scoblete). Basil Nestor explains and describes several blackjack techniques that are aggressive vs. those that are outright illegal (and could get you in the slammer). John Grochowski summarizes several blackjack games that he saw promoted at the recent Global Gaming Expo in Las Vegas. If you want to learn about the Oddman's bet in craps, check out Frank Scoblete's article. Frank Kneeland concludes his three part series on video poker training software, and last, but not least, we have a summary of upcoming major blackjack tournaments across the US from www.blackjacktournaments.com. With these two e-book, you can learn winning strategies for Blackjack Tournaments. Ken Smith, the best tournament blackjack player in the world, teaches you playing and betting strategies not available anywhere else. 200 pages of winning tips! Click here to purchase both e-books for the one incredibly low price of $24.95 (also available separately for $14.95 each). These Adobe Acrobat e-books can be read on any computer, mobile tablet, or smartphone. LVBear wrote this article in 2004 (issue #56 of BJI) on the casinos abuse of skilled players. The information in his article is just as appropriate today as it was back then. Click here to read the article. E-mail subscribers can also read each month's issue online at our web site: BJI Issue #154, November 2012. "Henry Tamburin interviews Colin Jones, who co-founded and managed 'The Church Team', one of the largest card counting teams in the past decade, taking millions from casinos along the way..."
"This is another true story that occurred at a defunct Strip casino that was run with the finesse of an organ grinder. What's funny is that the scam went down flawlessly but was still caught. 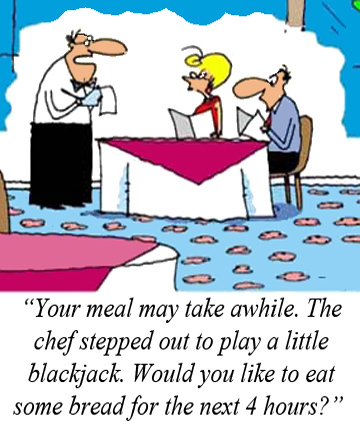 (How will amaze you)..."
"I generally write my blackjack trip reports based on a geographic region - a city or sometimes an entire state- so that a potential player will have the benefit of deciding whether he or she wants to play blackjack in that region. In this report, the geographic region is the 500+ long x 1 mile strip that runs from Kansas to the Minnesota border along I-35. If you are driving on I-35, you should see giant signs along the highway for these three casinos. The casinos are all within a half-mile of the highway..."
"If only more blackjack sessions could be like the one at Sam's Town Tunica on that gorgeous fall morning. My wife and I were in the first "OJ&BJ" outing (for the uninitiated, that's Orange Juice and Blackjack) of our late September-early October trip, and the cards were magical..."
"I made reservations at the best deal in town; The Sands Regency. There are nicer places like the Peppermill or the Atlantis, but they all look the same when your eyes are shut, and since I am not interested in dropping a load on a room, the Sands works out just fine..."
"This month I took a look at some casinos offering good games for the recreational blackjack player in the Las Vegas market. The three casinos I selected are geographically separated, but reachable with minimal effort for visitors and locals alike..."
"The latest updates on the blackjack playing conditions in A.C..."
"I was at a party a few years ago when someone I know pulled me aside. We talked about strategy, always very level-headed discussions. But this time he was breathless with excitement. He cornered me and jabbered with exhilaration, 'I have a perfect way to win a ton of money at blackjack. I want your advice'..."
"The conclusion on the history of video poker trainers, with a recommendation on which trainer is best..."
"The late and legendary Captain of Craps developed the idea of the "Oddsman's Bet" in the 1970's and it appears in my book The Captain's Craps Revolution!, which was published in 1993. It is a terrific way to decrease the house edge. In fact, if you only make the Oddsman's Bet, you will have no house edge against you except when you shoot. Not a bad tactic, right..."
"New table games always feel like a sideshow at the annual Global Gaming Expo in Las Vegas, with the huge flashy displays of new slot machines filling the Big Top. And new blackjack games are a sideshow within the sideshow..."
"Check out the schedule of major blackjack tournaments in November and October by region in our Blackjack Tournament Report courtesy of blackjacktournaments.com..."